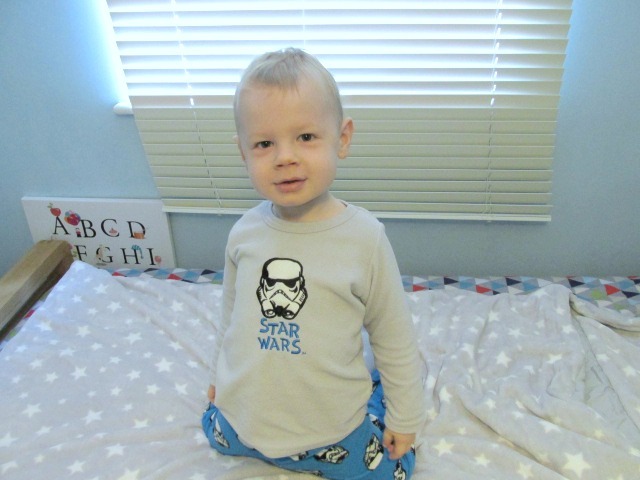 At the beginning of the year Blake had the bars taken off his cot to give him more freedom. However a few months ago when moving the bed over the wood snapped and so we made the decision to move him into a single bed. Since then we have been trying to get Blake to start sleeping with a pillow and duvet instead of in a sleeping bag however we have yet to be successful. Ollie & Leila got in touch to see if we would be interested in trying out a Snuggle Sac I thought it was a great product to try out as it is designed to ease the transition from cot to first bed. The bedding's aim is to make sure that active sleepers like Blake don't wake up cold in the night with covers on the floor. The Snuggle Sac is used as an alternative to traditional bedding as it is designed for toddlers. There is space in within the head area for a pillow and zip down the side like a sleeping bag. Snuggle Sacs help toddlers feel more independent and grown up. As they are developing this sense of being a big boy or girl is very important. We really love the grey and white stars design and the material makes it super snug. Blake is such a wiggle bum so at the moment we are still struggling with him to actually sleep in it. However he doesn't mind laying on top of it for awhile, so I think it's a matter of him needing to get use to the idea. We love that it comes in a handy holdall so that it can be taken away on holiday or if staying with grandparents to make toddlers feel secure in a different environment. The snuggle sac is also great for using for snuggling up in on the sofa too. The snuggle sac is machine washable and can be tumble dried which we feel is important. I can definitely see the snuggle sac working for us with Blake once he gets use to the idea. It's a handy item to have to ease the transition if your toddler is like Blake and hates change. The Snuggle Sac retails at £50 and we feel it's a great investment to have for keeping your toddler cosy, secure and independent. Have you used a snuggle sac? Do you have any other tips on getting your child use to a pillow and duvet? As always I'd love to know. Oh this looks great!! We used snuggle sacs for all of ours and it was the best thing for the as they couldn't wriggle out of them! It's meant to last them for 2 years depending on how soon they grow out of it height wise. I've worked out it would cost just over £2 a month. Less of course if used again for multiple children. I want a snuggle sac, never mind the toddlers! It would be perfect for snuggling up on a Sunday afternoon! Hope Blake learns to love it! Never heard of a snuggle sack before, great review. Looks like the kids love it! Zach has a sleeping bag which is fab as he is a wriggler! I've not heard of snuggle sacks before, but the really do look snug! These sound like a lovely idea. I wouldn't mind one for myself hehe! What a good idea - it's not a product I was familiar with, but it looks really good for bridging that transition between cot and bed! These sound great. I love the star print too, and Blake's pj's!